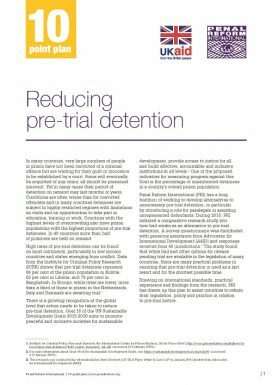 High rates of pre‑trial detention can be found on most continents, particularly in low income countries and states emerging from conflict. During 2015, PRI initiated a comparative research study into how bail works as an alternative to pre‑trial detention. The study found that while bail and other options for release pending trial are available in the legislation of many countries, there are many practical problems in ensuring that pre‑trial detention is used as a last resort and for the shortest possible time. Drawing on international standards, practical experience and findings from the research, PRI has drawn up this plan to assist countries to reform their legislation, policy and practice in relation to pre‑trial justice.